Macrame has been a popular way to decorate for decades, bringing texture and warmth into a home with knots that can be put together in unique ways to create one-of-a-kind wall hangings, plant holders, and more. It's easy to learn how to macrame because you only need to know a handful of knots to create a macrame project. Before you're ready to start learning how to macrame, gather your supplies and familiarize yourself with some common macrame terms you'll need to know. Macrame Cord: This can be just about any kind of cord, twine, or rope made out of cotton, hemp, jute, or synthetic material. It comes in different sizes, colors, and twists. In this tutorial, we used a 3/16" cotton cord sold as rope for clotheslines. Support: You'll need something to tie your knots to. Popular choices include dowel rods, branches, hoops, or rings. We used a dowel rod for these knots. There are a few important macrame terms you'll need to know before you can get started. Working Cord: The cord or set of cords that you use to make the actual knots. Filler Cord: The cord or set of cords that your knots wrap around. Sennit: A knot or set of knots that are worked in repeat. The first knot you'll need to know is the Lark's Head Knot, sometimes referred to as a Cow Hitch Knot. This knot is what gets your macrame cords attached to an object, such as dowel, branch, or an anchor cord. Fold your cord in half and place the loop over the dowel rod. Bring the loop around the back and pull your two cord ends through the loop to tighten. A Reverse Lark's Head Knot is done in the reverse, so the bump is hidden in the back of the knot. Fold the cord in half and place the loop under the dowel rod. Bring the loop round to the front and pull your two cords through the loop to tighten. A square knot is one of the most widely used macrame knots and it can be created as left facing or right facing. A half knot is simply half of a square knot. It can be right facing or left facing, depending on which side you start on. Square knots need to have at least 4 cords (2 working cords and 2 filler cords) but can have more. The first and last cords are the working cords. We'll call them working cord 1 and 4. The middle cords are filler cords and we'll number those 2 and 3. These cords will switch places but will still keep their original numbering. A left facing square knot has a vertical bump on the left side of the finished knot. Take the first cord (working cord 1) and move it to the right over the middle filler cords (filler cords 2 and 3) and under the last cord (working cord 4). Take working cord 4 and move it to the left under the two filler cords and over working cord 1. Pull both working cords to tighten, keeping the filler cords straight. This is a left facing half square knot. The working cords have now switched places with working cord 1 on the right and working cord 4 on the left. Take working cord 1 and move it to the left over the two filler cords and under working cord 4. Take working cord 4 and move it to the right under the two filler cords and over working cord 1. Pull both working cords to tighten. keeping the filler cords straight. This completes your left facing square knot. A right facing half knot and square knot has a vertical bump on the right side of the finished knot. Take the last cord (working cord 4) and move it to the left, over the filler cords (cords 2 and 3) and under the first cord (working cord 1). Take working cord 1 and take it to the right, under the filler cords and over working cord 4. Pull both cords to tighten, keeping everything straight. This is a right facing half square knot. The working cords have now switched places and working cord 1 is on the right and working cord 4 is on the left. Take working cord 4 over to the right, over the filler cords and under working cord 1. Take working cord 1 and move it to the left, going under the filler cords and over working cord 4. Pull both working cords to tighten. This is a right facing square knot. A Spiral Stitch, also called a Half Knot Sinnet or Half Knot Spiral, is a series of half knots to create a spiral stitch. This is a decorative knot that will add a lot of interest to your project. A spiral stitch needs at least 4 cords, 2 working and 2 filler cords, but more can be used. Mentally number these cords 1-4 moving left to right. Cords 1 and 4 are your working cords and cords 2 and 3 are your filler cords. These directions are how to make a left facing spiral stitch, but you can also start on the right side and use all right facing half knots. Take working cord 1 and move it to the right, over the filler cords but under working cord 4. Move working cord 4 to the left, going under the filler cords but over working cord 1. Pull both working cords to tighten around the filler cords. Keep making more half knots the same way as above. As you work, your cords will start to spiral. A Clove Hitch, also called a Double Half Hitch, creates lines in your projects. They can be worked horizontally, diagonally, and on occasion, vertically. 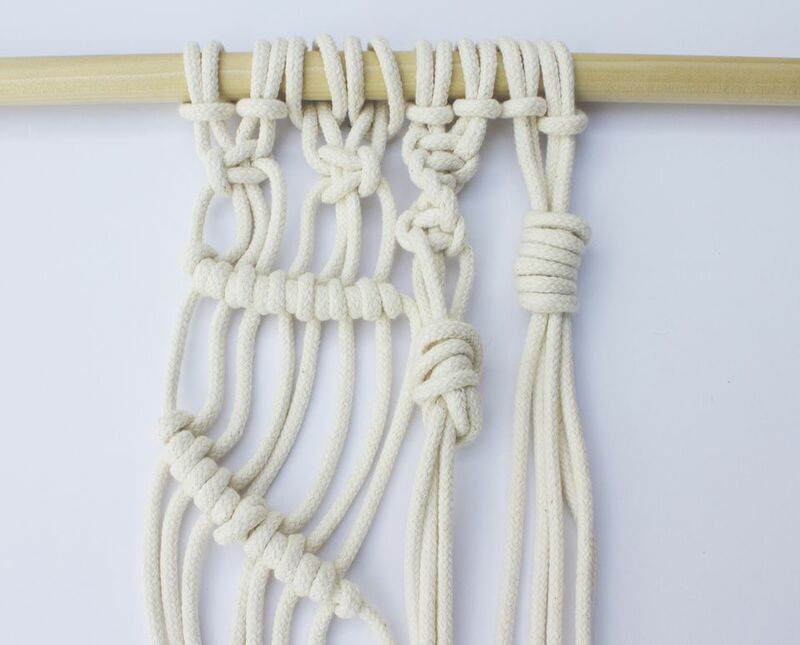 A Horizontal Clove Hitch creates a series of knots that go across your macrame project. In this knot, the first cord is the filler cord and rest of the cords are working cords. Take your left cord, the filler cord, and hold it horizontally across the other cords. Take the next cord (your first working cord) and bring it forward, up, and around the filler cord towards the left to form a counter-clockwise loop. Take the same working cord and to the right of the first knot, take it up, over, and through the loop. There should now be two knots sitting next to each other. This is a horizontal clove hitch knot. Repeat the clove hitch knots by using the next working cord around the same filler cord. Continue creating knots until you have the look you want. A Diagnol Clove Hitch creates a series of diagonal knots in your project. Take the cord on the left, the filler cord, and hold it diagonally across the other cords. Repeat steps 2 through 4 of the horizontal clove hitch, moving down diagonally instead of straight across. Repeat until you have the look you want. The Overhand Knot is a basic knot that ties multiple cords together. It can be done with multiple cords or just one cord. Fold the cord into a loop. Pass the ends of the cords through the loop to tighten. A Gathering Knot, also called a Wrapping Knot, is a finishing knot that gathers cords together. You'll often see these at the bottom of macrame plant hangers. There are two working cords in this knot; the rest of the cords are filler cords. Take a separate length of cord (this will be your working cord) and form a long u-shaped loop on top of the group of filler cords, with the loop facing down. Starting below the top end of your working cord—which is pointing up—wrap it around the filler cords and the loop. Make sure that you leave a little bit of the loop uncovered. Pass the end of the wrapping cord through the loop at the bottom of your wraps. Pull the end of the working cord—that's sticking up at the top—upwards, which will bring the loop under the wraps. Pull until the loop is enclosed in the wraps. Your gathering knot is complete! If you'd like, trim both ends of the working cord for a clean finish.